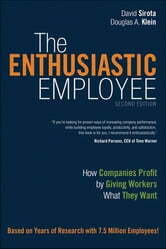 This book is about employee enthusiasm: that special, invigorating, purposeful and emotional state that’s always present in the most successful organizations. Most people are enthusiastic when they’re hired: hopeful, ready to work hard, eager to contribute. What happens? Management, that’s what. 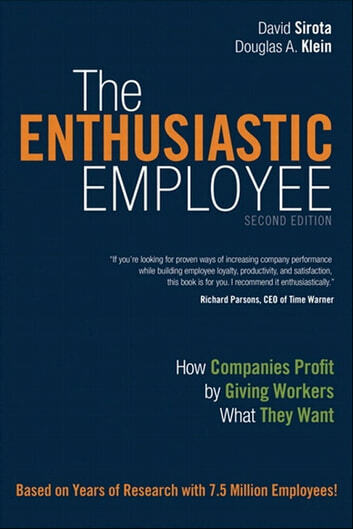 The Enthusiastic Employee is an action-oriented book that helps companies obtain more from workers - the basic premise is that under the right kind of leadership, the more one side wins in a collaborative relationship, the more for the other side. The book is heavily evidence-based (using extensive employee survey data) and lays out two basic ideas: the “Three-Factor Theory” of human motivation at work and the “Partnership” company culture that is based on the Three-Factor Theory and that, by far, brings out the best in people as they respond with enthusiasm about what they do and the company they do it for. Drawing on research with 13,000,000+ employees in 840+ companies, The Enthusiastic Employee, Second Edition tells you what managers (from first-line supervisor to senior leadership) do wrong. Then it tells you something much more important: what to do instead. David Sirota and Douglas Klein detail exactly how to create an environment where enthusiasm flourishes and businesses excel. Extensively updated with new research, case studies, and techniques (they have added over 8.6 million employees and over 400 companies to their analyses ), it now contains a detailed study of Mayo Clinic, one of the world’s most effective healthcare organizations and a true representation of the principle of partnership, as well as more in-depth descriptions of private sector exemplars of partnership, such as Costco. Other new chapters include: how the Great Recession really impacted workers’ morale (bottom-line, it didn’t) and how to build a true Partnership Culture that starts with senior leadership. They now debunk fashionable theories of worker “generations” (Baby Boomers, Gen X, Y, etc.) as mostly nonsense… clarify what they’ve learned about making business ethics and corporate social responsibility actionable… share what research on merit pay (pay for individual performance) tells us about its likely impact on school teachers and performance (not good)…discuss the utility of teleworking (and the dust-up at Yahoo)…offer compelling, data-informed insights about women and minorities in the workplace, and much more. You can have enthusiastic employees, and it does matter – more than it ever has. Whether you’re a business leader, HR/talent management professional, or strategist, that’s the workforce you need – and this is the book that will help you get it.